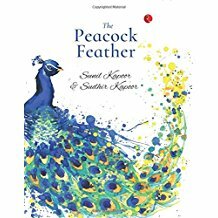 The Peacock Feather is a collection of ten short stories by Sudhir and Sunil Kapoor, who inform us in the preface that they are monozygotic (identical) twins. They believe that monozygotic twins have a telepathic connection which has led them to this joint writing project wherein they have drawn from shared real life incidents ‘blending them , with some fictional and imaginary happenings to inculcate some twist, turns and morals in them’ (p. viii). Having given this bit of information, it would have been interesting if the collection had also included stories individually scripted by each of the twins so as to provide scope for comparative analysis of their creative processes. In the title story ‘The Peacock Feather’, the narrator reminisces about his bitter sweet schoolboy love for Mohini whom he meets after thirty years. She is now a friend of his wife Shalini, who has invited her to Goa for a visit. The peacock feather has remained a lifelong symbol of his secret feelings for Mohini which he has harboured all his life. He learns at the end of the story that she has always been aware of his infatuation. ‘The Gutka King’ is a didactic rags-to-riches story of Seth Roshan Lal. A child from a poverty-stricken family from the outskirts of Rathampore, he goes on to build, over the years, a thousand crore empire of gutka manufacturing. The story drives home the need for hard work and perseverance in order to succeed, but elides over the hazards of gutka consumption. ‘A Misplaced Draft’ sermonizes on the evils of the dowry system. ‘Deceitful Paramour’ has a female protagonist, Meena, who is cheated by the man whom she elopes with. She is then rescued by his friend but there is an unexpected twist to the tale in its resolution, as is in the story ‘The Suicide Note’. ‘Train to Wagah’ attempts to recreate the trauma of the Partition, and the joy of a family reunited with their mother who had separated from them at the time of Partition. ‘The Accomplisher’ is an interesting historical reconstruction of the contribution of Colonel Sir B.C. Batty, who was an electrical engineer during the British Raj, and who defied the colonial authorities in his determination to bring electricity to the five-hundred kilometer area that encircled the Himachal Pradesh hill town of Barot. The authors however lose marks for veracity of facts in ‘The Wambesi Throne’ which is set in the Congo and draws from the exploitation of uranium resources from the Shinkolobwe mines by European and American colonial forces. The authors seem to have got their geography wrong—the Congo does not have a border with South Africa, Botswana and Angola as stated in the story (p. 145). Also, the Prince Wambesi, we are informed, is sent to Zaire for his studies from the Congo in the 1930s. It is a historical fact that Zaire as a nation state came into being only after being renamed in 1971 from the Congo democratic republic. The Wambesi too is a fictitious tribe drawn from the Phantom comics. The collection includes straightforward narratives such as ‘Nightmare in London’ and ‘A Misplaced Throne’ and ‘King Cobra’. The stories are set in locations that are competently described and include Missouri, Goa, Malaysia, Singapore and London. The Peacock Feather is the kind of book that one could pick up to read leisurely on a journey, as the narratives do not call for an engagement at either an intellectual or philosophical level. The plots of these short stories are straightforward, and let you unwind without demanding an emotional investment in the characters. The authors are first time writers and this is reflected in their style. There is an eagerness to please and the simplicity of language at times veers on a naivety of style. The authors need to fine tune their craft of storytelling. There is a tendency towards explication which is perhaps not required for an Indian readership. What keeps the reader engrossed, however, is the storyline with its twists that manage to rouse curiosity and sustain the reader’s interest till the end of the story. Mala Pandurang is Vice Principal and Head Department of English, Dr BMN College, Mumbai.